Queen’s University at Kingston (commonly shortened to Queen’s University or Queen’s) is a public research university located in Kingston, Ontario, Canada. Founded on 16 October 1841 via a royal charter issued by Queen Victoria, the university predates the founding of Canada by 26 years. Queen’s holds more than 1,400 hectares (3,500 acres) of land throughout Ontario and owns Herstmonceux Castle in East Sussex, England. Queen’s is organized into ten undergraduate, graduate and professional faculties and schools. The Church of Scotland established Queen’s College in 1841 with a royal charter from Queen Victoria. The first classes, intended to prepare students for the ministry, were held on March 7, 1842 with 13 students and two professors. Queen’s was the first university west of the maritime provinces to admit women, and to form a student government. In 1883, a women’s college for medical education affiliated with Queen’s University was established. 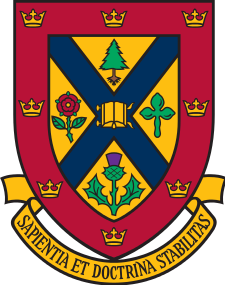 In 1888, Queen’s University began offering extension courses, becoming the first Canadian university to do so. In 1912, Queen’s secularized and changed to its present legal name. Since graduating in 1973, Jeff has maintained a close relationship with his “alma mater”. While working in the Chicago area from 1984-88. he helped found the Queen’s University Midwest Alumni branch and was its inaugural Treasurer. During that time the branch hosted Principal David Smith and his wife Mary as the guest speaker for the Chicago Canadian Universities Dinner, and CFL and NFL Coaching great, Bud Grant, at a Grey Cup viewing. Jeff subsequently served on the Queen’s University Board of Trustees and its Advancement and Nominating Committees, the Joint Board and Senate Principal’s Review Committee, and the Queen’s Centre Executive Committee. He was the alumni representative on the Queen’s University Council on Athletics, and also served on the Queen’s Alumni Association Board, and the University Council. For his service to the Alumni Association, he was honoured with the Herb Hamilton Award in 2005. © 2019 Copyright Growth Alchemy.